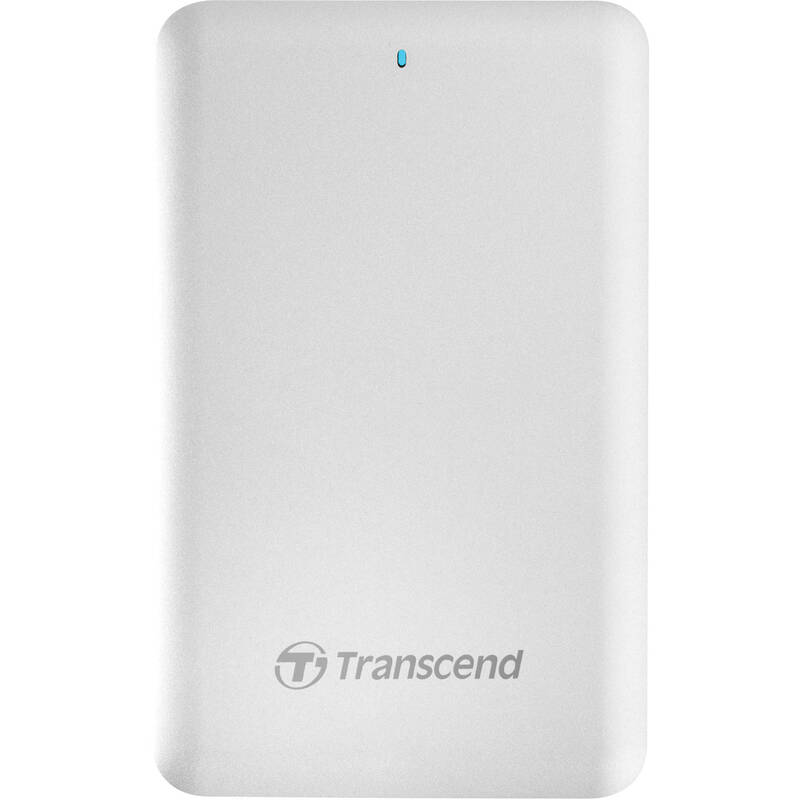 The 1TB StoreJet 500 Portable Solid State Drive from Transcend is formatted in HFS+ for use with your Mac and it connects via Thunderbolt or USB. It is also compatible with Windows computers but requires reformatting. The StoreJet 500 is equipped with a Thunderbolt port for transferring data to your computer with a rate up to 10 Gb/s. In addition, it is also built with a USB 3.0 port that provides 10 times the bandwidth of USB 2.0. The SSD offers a read speed up to 440 MB/s that provides rapid access to your HD videos. Compared to a hard drive, the SSD features no moving parts, which allows it to run coolly and silently. Additionally, it can withstand five times greater shock than hard drives, giving your data comprehensive protection. The StoreJet 500 supports Time Machine, which allows you to back up and synchronize data on your Mac computer. Transcend also offers a free download of Transcend Elite data software that makes it easy to keep important files organized, protected, and up-to-date. Furthermore, the StoreJet 500 powers itself from your computer via Thunderbolt or USB. Included with the StoreJet 500 are Thunderbolt and USB 3.0 cables and a travel pouch. With advanced Thunderbolt technology, the SJM500 portable SSD offers transfer rates of up to 10 Gb/s. In addition to the Thunderbolt interface, the SJM500 is also equipped with a SuperSpeed USB 3.0 port with UASP support, providing 10 times the bandwidth of USB 2.0. The SJM500 SSD is natively formatted in HFS+ for your Mac and fully supports Time Machine. The SJM500 can withstand 5 times greater shock than hard drives, giving your data comprehensive protection. Moreover, its high-quality metallic design complements your Mac with a sleek and elegant look. Transcend Elite includes user-friendly applications that help you manage your data and increase productivity. With Elite, your Transcend storage device can keep important files organized, protected, and up-to-date. Box Dimensions (LxWxH) 6.6 x 3.8 x 2.2"
1TB StoreJet 500 Portable Solid State Drive for Mac is rated 4.8 out of 5 by 10. Rated 4 out of 5 by Anonymous from Portable, Fast, Hot A keyboardist and guitarist, I bought this drive to decrease load times of instruments and samples and increase the responsiveness of my live performance rig. It's size and weight are big plusses. Running speed tests revealed that the read and write speeds are very close to equal whether using USB 3.0 or Thunderbolt 2. The tests show write speeds of appx. 285 MB/s with read speeds around 375 MB/s. Though it seems no faster than USB 3, I needed the Thunderbolt port as my rig uses all available USB ports. This added a bit of expense to the purchase vs. a USB only port, but it is good to have a choice. It does run on the warm side, though I'm told it's not enough to adversely affect a SSD. Love that it's bus powered thru either interface and comparing it's speed with my previous 7200 RPM drive was no contest. So far, it has performed quite reliably and I'm pleased with the purchase. Rated 4 out of 5 by chuck from Great backup Drive for MAC. When I first received it I did a good visual on it since he shipping box did not have sufficient packing in it. The manufacturers packaging was very good and was complete. Plugged the drive into the computer and it worked fine for about a day. The following day I received a error so I ran a drive testing program on it. It said I had a "B" tree error recommended and said it could not be fixed. I verified the error with disk utility and it also said it could not be fixed. It recommended wiping it clean and reformatting it. Since I reformatted the drive it works fine. It runs a little hot but that is normal for this drive. Rated 5 out of 5 by Philo Willetts from Fast. This is a fast transferring, large capacity external hard drive. I use it for my Lightroom default photo download location, and it works perfectly. Data travels at thunderbolt speed, with no perception of delay in download or retrieval. Well worth the price to expand my computer's capabilities. Rated 5 out of 5 by Paul from Seriously quick drive Great Drive. Runs hot but who cares-it's so fast. Runs big InDesign files, cache on PS and provides a nice boost to my workflow. It's wonderful to be able to move between a Mac Pro and laptop without any great distinction in access times to big files. Back-up in seconds to a network server. Rated 5 out of 5 by Michael from Extremely satisfied Lightning speed, attractive design, excellent build quality, nice packaging, and rock-solid reliability after over two years of use as the primary SSD drive for my aging mid-2011 iMac. I love this drive and I will be keeping it to use it as supplemental storage for my new iMac! Rated 5 out of 5 by freedom from Very Happy I am very happy w/ this drive. I use VMWare to compile a VERY LARGE software project on Windows, Linux, and OSX. Compiling is extremely I/O heavy and this drive is an order of magnitude faster than traditional drive. Unscientifically I'd say it cut my compile time in half. What is the return policy if opened? i am looking into upgrading my G HDD 1 TB external portable hard drive for my mac into an SSD hard drive, i do understand the price variations between the HDD and the SSD (Speed obviously) but between 1TB SSDs themselves the price variation does not make sense, for example, the Transcend 1 TB SSD with thunderbolt is $500 and the Akitio 1TB SSD with thunderbolt is $800, and the G-tech SSD is also an $800 with Thunderbolt. this makes it very hard to take a decision of which one to buy.there is a $300 difference, why will i spend $300 more for the Akitio? anybody can help ? 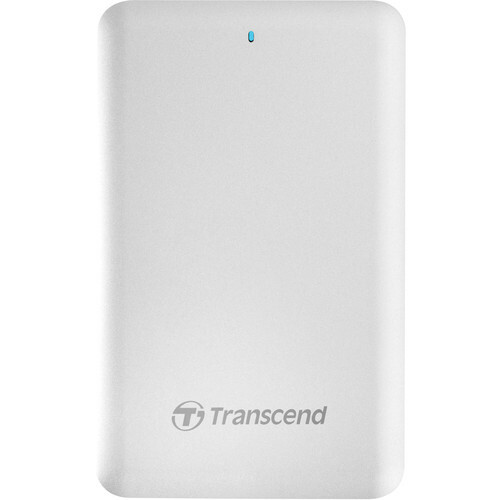 WELL GILBERT H.,I have the Transcend and it works great with my MacBook Pro 15 . I can only guess the others are a bit faster for video, but that is only a guess.I have used the Transcend for a month now traveling all over Europe, the US and Canada without a problem. As a matter of fact, I will be purchasing an additional Transcend for a safety back-up. I am a pro photographer and artist. I use one 3 TB HDD, the one Transcend and the cloud. Adding another Transcend to back up everything and leave it in a separate location just feels a little better.Hope this helps,Jeff M.
hi, i am very confused between spending 589 USDollars to buy this 1TB thunderbolt SSD Transcend which mentions speeds up to 440MB/s or spending $300 on the samsung 1TB USB3 with speeds up to 450MB/s (double price). i will be using the SSD for 4K video editing directly from the SSD, what do you think i should do ? (by the way, i do have a MACPro 15, and do have all my USB slots open (unused). Hi, I bought the Transcend thunderbolt drive after I had a Sony USB 3 SSD broke on me. Apparently the USB 3 connectors broke and shorted out the chipset. It costed me dearly to have the data salvaged from that drive.I find the USB ports to be finicky and prone to damage. USB speed is fast but not as solid and reliable as thunderbolt. I would be very careful if you need to constantly plug in and out.I have been using the Transcend 1TB for 6+ months with my MacBook Pro. Like you, I use it for editing on the move. It's good for 4K as I video in 4K too. It's not fast enough if you're not doing a lot of multichannel editing. Single stream is generally good enough.